You drive at a constant speed of toward the stopped dragster, not slowing down in the face of the imminent collision. The dragster driver sees you coming but waits until the last instant to put down the hammer, accelerating from the starting line at constant acceleration, . Let the time at which the dragster starts to accelerate be . PART A. What is , the longest time after the dragster begins to accelerate that you can possibly run into the back of the dragster if you continue at your initial velocity? PART B. Assuming that the dragster has started at the last instant possible (so your front bumper almost hits the rear of the dragster at ), find your distance from the dragster when he started. 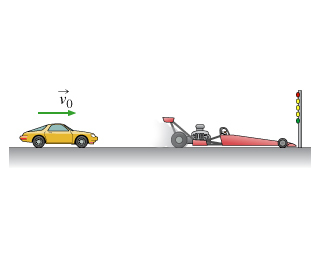 If you calculate positions on the way to this solution, choose coordinates so that the position of the drag car is 0 at t=0. Remember that you are solving for a distance (which is a magnitude, and can never be negative), not a position (which can be negative). 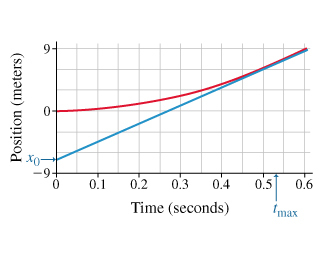 The blue curve shows how the car, initially at , continues at constant velocity (blue) and just barely touches the accelerating drag car (red) at .